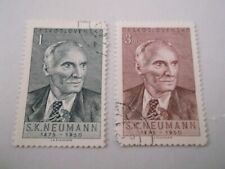 75th Anniversary of the Birth of S. K. Neumann. Good condition - Unmounted mint corner marginal blocks. Composers Birth Centenaries. Czech Republic. The stamp is used, in good condition and currently lightly hinged. The stamp appears unused, in good condition and currently lightly hinged. The stamp is used and in good condition. 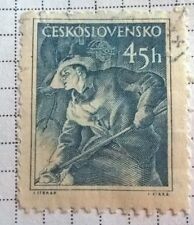 Czechoslovakia stamps - Postman 15 Czechoslovak haléř 1945? The stamp appears unused although having franking marks, and in good condition.